A lovely antiqued gold brass cross with amazing detail is the centerpiece of this beautiful one-of-a-kind Victorian styled necklace. Accented in its center is a stunning multi colored glass opal cabochon showing varying shades of pinks, lilacs, and gold. 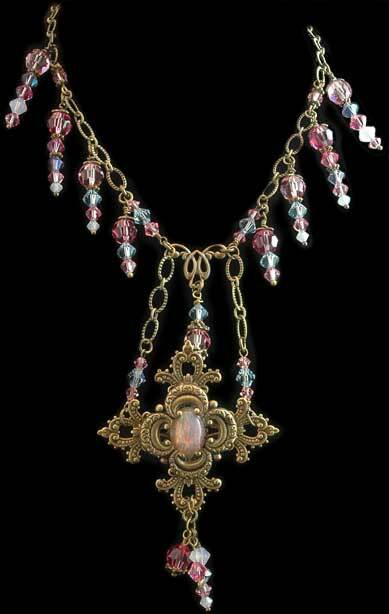 Swarovski crystals embellish the beautiful etched brass chain in colors of pinks, lilacs and white satin opal to accent the delicate coloring of this exquisite piece.